This weekend, I had the distinct pleasure of celebrating a momentous event: Mandy finishing graduate school. Mandy got an undergrad from Illinois State University, then went on to start her Public Service Administration program at DePaul. At 22, Mandy is all finished up and has a master's degree (and she's looking for a job, if you know somebody who knows somebody). We are all very proud. My family got together for a little celebration to mark the date. She turned in her thesis last week and on Saturday, we had cake, deliciously awesome baked goods courtesy of my mom and more Mexican food (as previously stated, I might have a Mexican food problem). My sister loves bacon and has referred to it as the candy of the meat world. We also both love chocolate, so why not have the best of both worlds? Yes, this is a sometimes treat. Preheat the oven to 400 degrees. Place the bacon in a single layer on a baking sheet and bake the bacon until crispy, about 15 minutes. Make sure it's crispy, the texture is important. Remove from the baking sheet to drain on paper towels until cool. Meanwhile, melt together the remaining items in the microwave, heating for 30 seconds and stirring, then repeating until smooth. Place the melted chocolate into a shallow dish, then dip one half of the bacon into the chocolate. 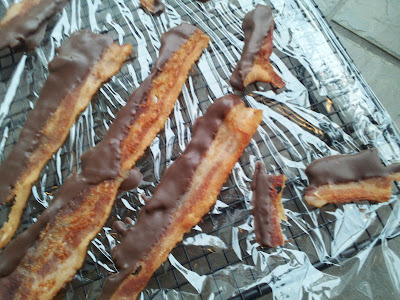 You could also drizzle the chocolate over the bacon if that's your style. Place onto a cooling rack wrapped in Saran wrap or parchment paper, then refrigerate until the chocolate is set. Serve to an adoring public. Seeing this makes me so happy!!! Last year, we had a surprise party for my husband and my sister-in-law (both turned 30 within a week of each other). I brought bacon-wrapped dates, my other sister-in-law set up her chocolate fountain, and there was a lot of other food. Anyway, I started dipping bacon-wrapped dates in the chocolate fountain and it was DELICIOUS! But no one believed me. 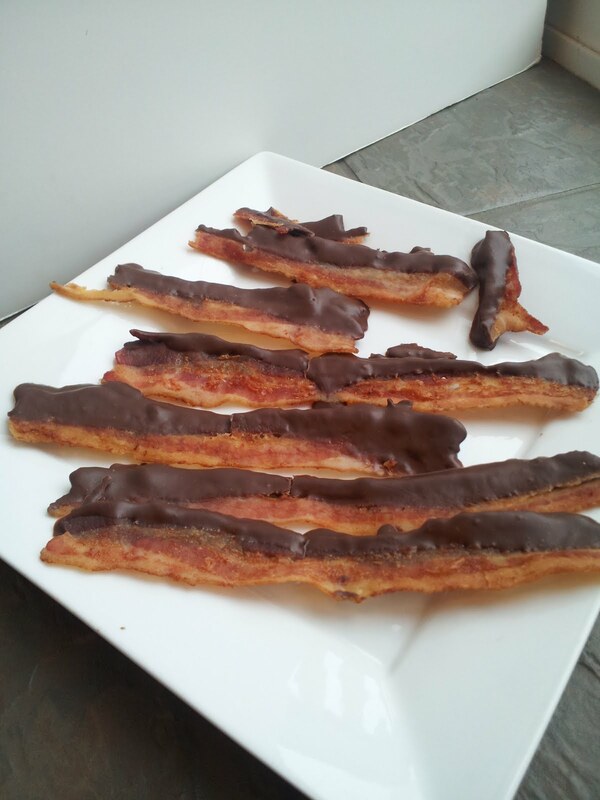 To this day, no one in my family believes that chocolate + bacon = delicious. Their loss, really. But from now on, anytime I know that chocolate fountain will be out at a party, I am bringing bacon or something wrapped in bacon.